At Great Rads we have assembled an unrivalled range of Towel Radiators, all with Free UK Delivery. The Radox Linx Towel Radiator has a unique and beautiful tube through tube design, which keeps it sleek, balanced and ready to pounce. Perfect for sliding towels on and off, it's fully reversible for right or left hand situations. The Radox Linx is available in 3 stunning finishes, Cappucino, Chrome or Black Pearl. 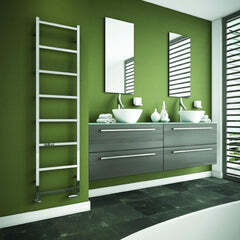 The Barnes Designer Towel Rail is a glorious design. It has modern flat horizontal bars, and as an added bonus is reversible depending on what side you want the opening. This is the product page for the Black Version. 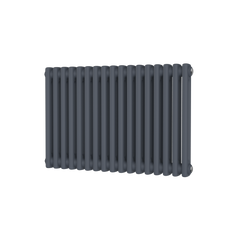 The Radox Cannon Towel Radiator provides more heat than any similar styled radiator. Perfect for a blast of heat in your bathroom. 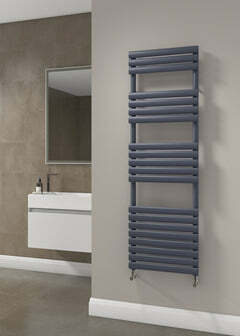 This Towel Radiator can be installed with the tubes on the left or the right hand side. The Radox Cannon Towel Radiator is made out of Stainless Steel and Black Pearl. The St. James Stainless Steel Towel Rail is an amazing open end stainless steel towel radiator that adds a luxurious setting to any bathroom. The St. James can come in an amazing reflective stainless steel finish that adds to its already amazing looks. Stainless Steel is amazing for any bathroom due to the fact it doesn't rust or corrode - making it also perfect for wet rooms and with the open-ended bars it allows to place and remove towels with ease. The St. James comes with a huge 30 year guarantee. 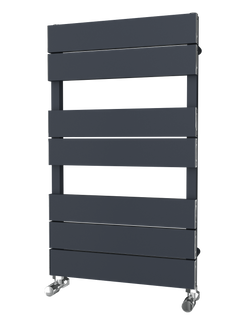 The SBH MEGA Slim Curve Towel Radiator is an elegant and simple ladder rail. Made from stainless steel with a contemporary look, this towel rail will not leave you short of hanging space. The SBH MEGA is a real quality rail and would look stunning in any bathroom.